Mapletree Investments sold S$625 million perpetual bonds on Thursday, and this first Singapore dollar bond issue for the year drew a robust reception amid a rebound for local debt. Orders for the perpetual bond sale by the 100-per-cent Temasek-owned company reached over S$900 million. The final price was settled at 4.50 per cent, lower than the initial price guidance of around 4.7 per cent. As at the end of last September, the real estate company owned and and managed property assets worth S$36.9 billion; these assets included office, retail, logistics, industrial, residential, corporate lodging/serviced apartment and student-housing properties. Mapletree Investments currently manages four Singapore-listed real-estate investment trusts (Reits) and five private-equity real-estate funds, which hold a diverse portfolio of assets in Singapore and the Asia-Pacific. The group's assets are located across 12 economies globally, namely Singapore, Australia, China, Germany, Hong Kong SAR, India, Japan, Malaysia, South Korea, the United Kingdom, the United States and Vietnam. The perpetual bonds are NC5, which means that they would not be called or redeemed before Year Five, or January 2022. Another feature of the issue is that the coupon will have a 100-basis-points step-up and reset from Year 10. This means if the issue is not called in Year 10, the new coupon will be the prevailing 10-year SOR (swap-offer rate) plus the original credit spread at the time of pricing, plus 100 basis points. It will also include a change-of-control call, which gives the issuer the option to either redeem the bonds at par upon a change of ownership (if Temasek no longer owns at least 50 per cent of Mapletree Investments) or to step up the coupon by 100 basis points. DBS and HSBC are handling the sale. Bankers say the improving investor sentiment for SGD bonds are due to softer interest rates and a weaker USD. 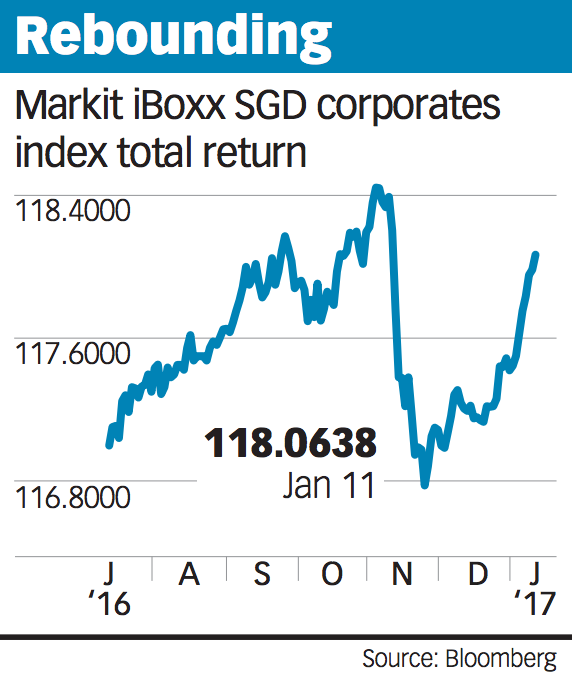 The Markit iBoxx Singapore corporates return index reached 118.0638 on Wednesday; it has been rising since mid-December. The index had hit an all time high of 118.4405 on Nov 3. Terence Lin, assistant director of bonds and portfolio management at fund researcher iFast, said: "On a broad basis, rates have pulled back somewhat on the back of the decline in the USD-SGD exchange rate, so this has boosted prices of SGD corporate bonds across the board." The SGD rose to S$1.426 on Thursday, up from S$1.438 on Wednesday; it has rallied after reaching a year-low of S$1.45 on Dec 28. Mr Lin said: "Sentiment appears to have improved somewhat, with investors looking at higher-yielding SGD corporate bonds again."